This stunning basket is hand made here in Sydney, Australia. 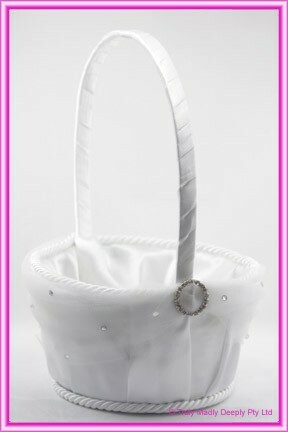 It features a real cane basket covered in satin and organza. 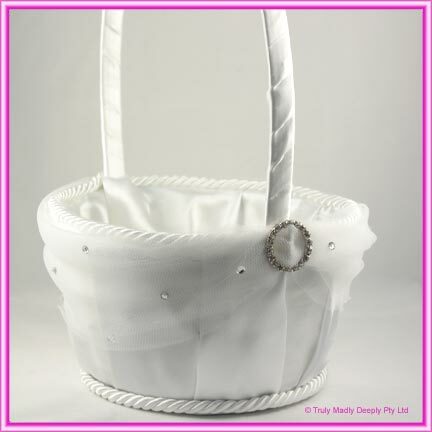 The organza has lots of diamantes on it, and the base of each handle features a stunning round diamante buckle. This flower basket has an internal diameter of approx. 15.5cm and It is presented in a clear cellophane gift wrapping. Matching ring cushion is also available for the page boy - see below for details.